For a winter getaway, I like to go somewhere sunny. From my home on the west coast, and from many other places in Canada, San Diego is an easy destination to get to. And who doesn’t like southern California? The ocean climate is mild and the sun shines most of the time. There is a lot to see and do in this area as well, but since I don’t agree with keeping animals in captivity, I decided to see San Diego without going to the famous San Diego Zoo. My time is pretty flexible, so I was able to pick a week in February when the short-range weather forecast was for sunny skies. Travelers should be aware, though, that the best time to visit, weather-wise, is probably April or October. November through March is the rainy period in Southern California, but keeping in mind that San Diego only gets about ten inches of rain a year, and only forty-three days a year have measurable rainfall, there are lots of winter days that are clear and dry. A minor consideration is the ground fog that often appears at night along the coastline and burns off by early morning. Like any coastal city, the waterfront is where the city of San Diego began. When Spanish explorer Juan Rodriguez Cabrillo arrived in 1542, he found the Kumeyaay Indians dividing their time between the river estuary and the mountains. When the Spanish returned to establish a military outpost and the first mission in 1769, they naturally selected a site close to the water for the Presidio, and one inland for the mission. The Presidio was built on a hill with a good view of approaching ships, and within cannon shot of the harbour. Historic Old Town grew up at the base of that hill, first as a place for trade, and later for residences for Spanish soldiers as well. This is a good place to begin your exploration of San Diego. As a starting point, look for the Robinson-Rose House that now serves as the Visitor Information Building. 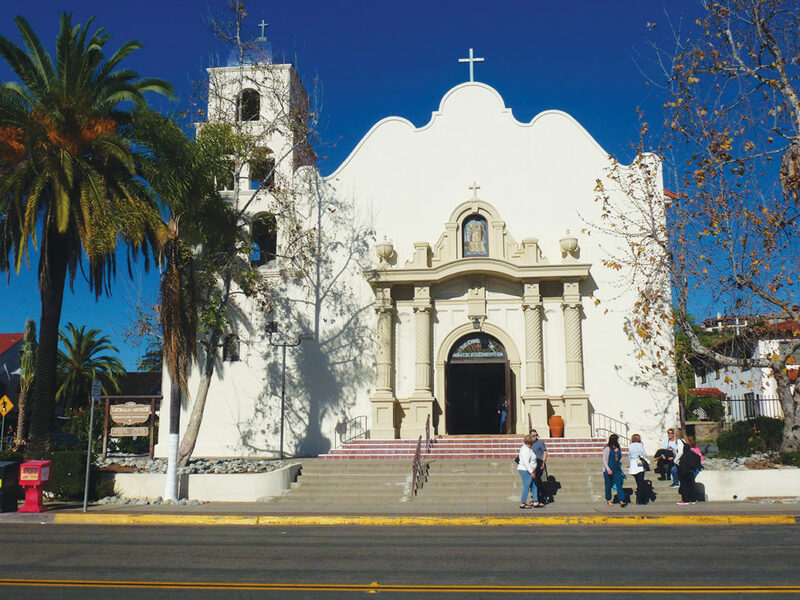 Declared a State Historic Park in 1968, Old Town is home to some of the oldest buildings in California. The early settlement was controlled by Spain until Mexico’s independence in 1810, and by Mexico up until the mid-1800s, so you will see the Spanish and Mexican influence in the architecture both here and around the city. Along with the interesting architecture of Old Town, you will find museums, demonstrations by people in period dress, and guided walks, as well as tasteful shops and restaurants that complement the historical experience. 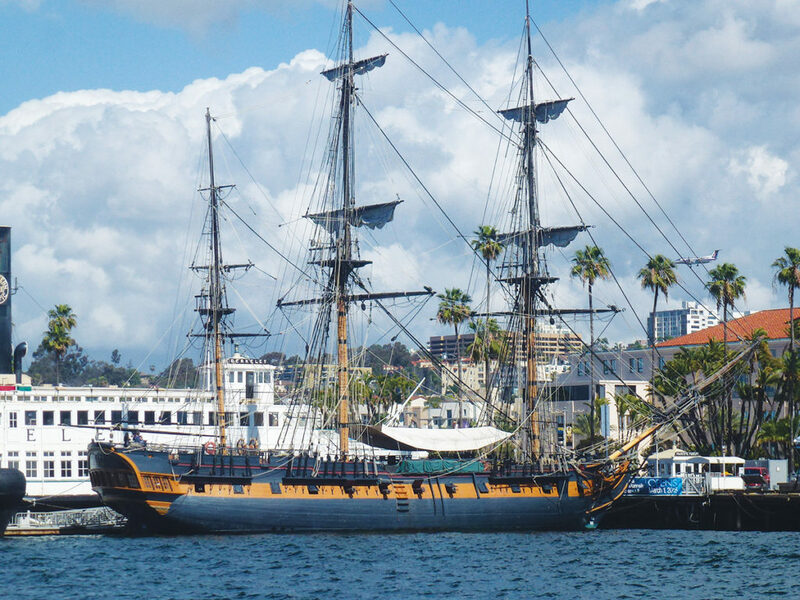 San Diego, sometimes called the “birthplace of California,” was claimed for the United States during the Mexican-American War by the U.S. Navy, and the Navy has played a pivotal role in the security and development of the area ever since. 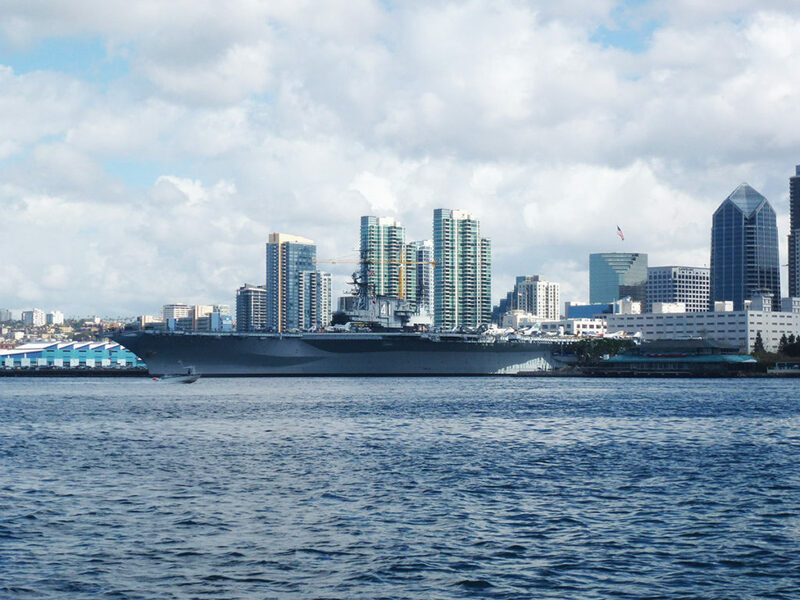 Today, strategic San Diego Bay is dominated by Navy ships in port or undergoing repairs and refits. There are also a number of military airfields and barracks in the area, including Marine Corps Air Station Miramar, the former location of the TOPGUN training program and the subject of the 1980s movie of the same name. As a point of interest, the building height in the city is controlled by the Federal Aviation Authority (FAA) due to the proximity of the military and civilian airports around the city and the flight paths of the aircraft. No waterfront city is complete, in my opinion, without a maritime museum, and the Maritime Museum of San Diego fills that requirement nicely. It is located in downtown San Diego, alongside Waterfront Park, and is composed of twelve floating exhibits. Among them is Surprise, originally built as a sail training vessel from the plans of the Royal Navy frigate, HMS Rose. It operated for thirty years on the east coast as a sail training vessel before being bought by 20th Century Fox and modified extensively in historic detail for use in the film, Master and Commander. There is also Star of India, built in 1863 and now an actively sailed exhibit. You will also see Dolphin, a U.S. submarine that holds a number of performance records, B-39, a Soviet-era attack submarine, and PCF 816, a vessel used to patrol the coast of South Vietnam in the late 1960s and early 1970s, known for her speed and agility. Pilot, built in 1914, is the oldest wooden pilot boat in the USA, and provides daily, forty-five-minute harbour tours on San Diego Bay for the bargain price of $5. Half a mile south of the maritime museum along the Embarcadero is the USS Midway, an aircraft carrier that saw service from 1945 to 1992. Now a static exhibit and one of the top attractions in the city, the USS Midway Museum is also worth a visit. At 1001 feet overall length, it was the largest vessel in the world until 1955, and the first vessel that was too big to transit the Panama Canal. This floating museum houses sixty exhibits, including restored aircraft and examples of onboard living conditions. You will hear what it was like to live and work on board, where pilots experienced a catapult launch that took them to a speed of 150 mph in three seconds, and you can try your hand at flying in two flight simulators. Minutes from the waterfront is fabulous Balboa Park, which is described as “the nation’s largest urban cultural park.” Their brochure describes in detail the magnificent Spanish Renaissance architecture, 1200 acres of lush landscaping and beautiful gardens, fifteen major museums, renowned performing arts venues, the San Diego Zoo, and unique restaurants. This was the site of two expositions, the 1915-16 Panama-California Exposition commemorating the opening of the Panama Canal, and the 1935-36 California Pacific International Exposition. You could spend days here, seeing such diverse and interesting things as Egyptian mummies, historic aircraft, model railways, European Old Master paintings, giant pandas, indigenous art and culture, ancient Japanese artifacts, images of the earliest galaxies and the surface of Mars, Tony Award-winning theatre, an IMAX adventure into the lush tropical islands of West Papua, and an exhibit celebrating the artistic legacy of beloved San Diegan and children’s book author, Dr. Seuss. 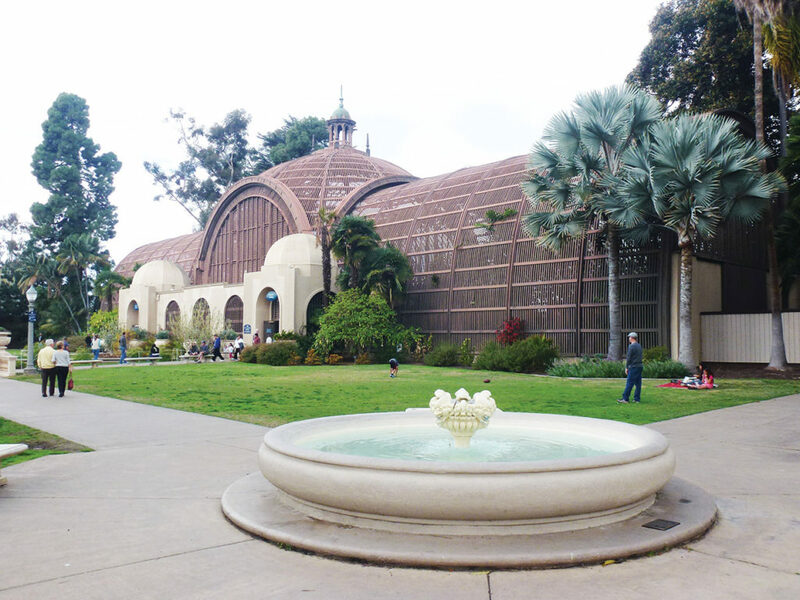 You should plan ahead for your visit to Balboa Park to make the most of your time, but be assured that there are guided and audio tours available to help you enjoy your visit. There is so much to see and do around San Diego that it can be a little daunting. 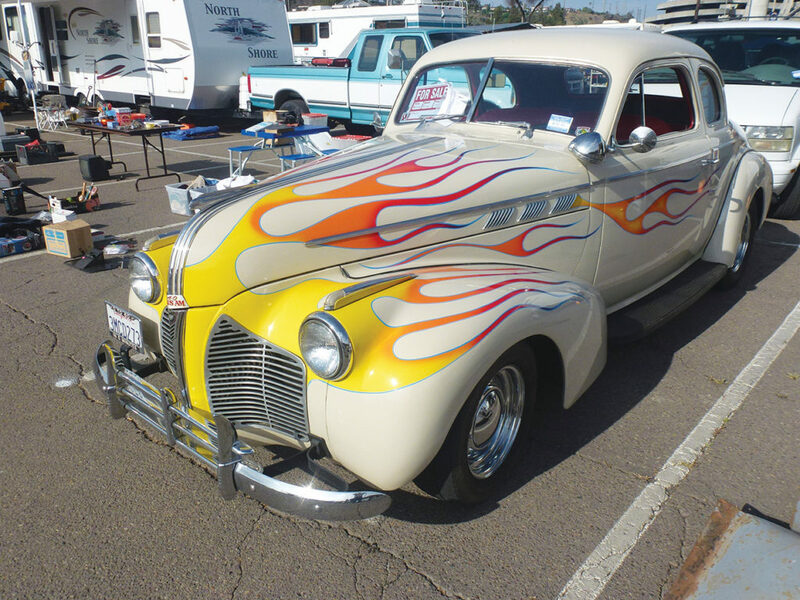 I went there partly to see “The Big 3,” a gigantic three-day car show and swap meet at the San Diego Chargers’ stadium, featuring thousands of exhibits and vendors. Aside from that, I was lucky to have friends nearby who drove me around to see the neighbourhood sites, like the excellent Hillcrest farmers’ market, as well as the highlights of the San Diego area, making my trip more efficient. But I also like to explore. I found that it was useful to have a car so that you can stop when you want to, stay as long as you like, and find places like the Sunny Jim Cave that you might not see otherwise. By the way, when we found this land access to the cave, I also learned that there are more sea caves to explore by kayak on my next trip. It certainly helped to have friends with a car to do the oh-so-pleasant drive north along the coast road through La Jolla, Torrey Pines, Del Mar, Encinitas, Carlsbad and Oceanside. But if you don’t want to drive, there are plenty of guided tours you can take to go to many of the same places. If golf is your thing, you should know that Golf Digest named San Diego one of the top fifty golf destinations in the world. There are ninety golf courses in the region, including a few across the line in Mexico. Perhaps best known is Torrey Pines Golf Course, PGA Tour stop for the Farmers Insurance Open. You can choose from among the public courses by your choice of cost and skill level. And then there are the beaches, central to many travelers’ holidays. Here there are miles of beaches, and one that even caters to your pets. Dog Beach, at the north end of Ocean Beach, is San Diego’s only 24-hour beach for dogs. For those people planning a road trip, there are lots of good places to stay in the area, including San Diego County campsites or commercial campsites and RV parks. I stayed with my friends, but I saw many reasonably priced motels outside of the city, and an ample choice of hotels in the downtown precincts as well. Whether you seek a cultural experience, good food, or an outdoor adventure, you have a huge range of options in San Diego. Alan Boreham is a world traveler and co-author of the memoir Beer in the Bilges, Sailing Adventures in the South Pacific, available from Amazon and other booksellers. Blog: beerinthebilges.wordpress.com/.